That’s right – for just a dollar more you can have aluminum plugs and a corded fabric cable instead of plastic and… More plastic. The Juicies is fashioned from “sandblasted anodized aerospace aluminium,” and comes in black or white to match your iDevice. The connector housings are thin to fir even if you’re using a case, the woven cord covers are designed to be tangle free, and the cables are shielded and reinforced at the plug entry points. 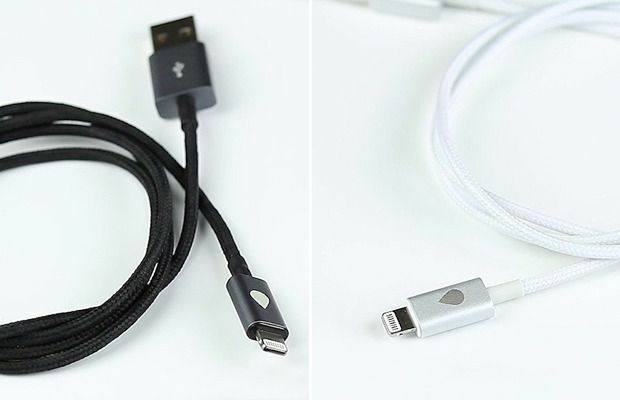 The cables also use original Apple MFi Lightning connectors, which means that you’re getting a proper connector that won;t have your iOS7 device refusing to work with it and throwing up an error message. The only downside is availability. This is a Kickstarter, so you’l have to wait until January before your order is filled.